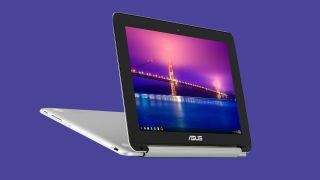 Chromebooks for the most part have followed a model to be inexpensive 11- to 13-inch machines without much deviation. This year we're starting to see that mold break apart with the Acer Chromebook 15 and now Asus has unveiled a new convertible Chromebook called the Flip. Available later this spring for $249 (about £167, AU$327), the Asus Flip is just as affordable as any Chromebook, but if features a screen that you can…well, flip back a full 360-degrees to turn it into a Chrome OS tablet. The screen itself is a 10.1 inch IPS panel with a 1280 x 800 resolution, which is just a tiny bump up from the traditional 1,366 x 768 resolution screen most 11-inch machines come with. While the Lenovo N20p has the honor of beating the Flip to the convertible Chromebook, this machine also features an all-aluminum chassis that 15mm thin and weighs less than two pounds. For the computing guts, Asus has gone with 4GB of RAM, a 16GB SSD and a fanless Rockchip 3288 CPU. That might not be a household name next to Intel's Core M but it's an ARM chip based on a 32-bit quad-core Cortex 17 design. On paper this 2GHz quad-core processor should be more than adequate for web browsing, meanwhile benchmarks from CNX-software have shown it running laps around an Intel Baytrail Atom processor. On top of the Flip, Asus 11.6-inch Asus Chromebook C201, which will also feature the same Rockchip 3288 processor. The new machine is due to go on sale at Amazon this May with a starting price of $169 (about £ 113, AU$221) for the 2GB version alongside another 4GB model. We also have a new players in the Chromebook space with Hisense and Haier, two electronics manufacturers from China. Firstly, there's the Haier Chromebook 11, an 11.6-inch Chromebook that comes sporting a Rockchip 3288 chipset with 2GB of RAM and 16GB of storage. Haier claims its first Chromebook will have a battery life of 10 hours and it's already available on Amazon for $149 (about £100, AU$195). The Haier also has plans to release a Chromebook 11E made specifically for the education market that's more durable with a spill proof keyboard as well as a removable battery. Hisense, meanwhile, announced its own Chrome OS laptop will be available for preorder on Walmart for $149 (about £100, AU$195). For the price you'll get an 11.6-inch cloud-based machine with 8.5 hours of battery life with practically identical specs as the Haier Chromebook 11. Chrome OS is great but its it missing any features?